A 3×4 sized room, walls all painted in melted butter colour, probably from the previous owner or the landlord purposely picked it with no apparent reason, with a small window in the corner of the room. It wasn’t so big as it were described, but it was enough for us to share things and be ourselves. There was no scent that lingered unless one of us lit a candle or intentionally wore perfumes to go out. There was nothing special about the room, only single sized bed with lavender linen. Kind of dingy because the owner forgot when the linen was last replaced, but the bed comfy still. The bed, I must say, was the subject of the room. We did everything in bed. I emphasized the word everything there. The reasons were that, it was always the place for us to eat; sometimes lunch, mostly dinner, we did most of the college assignments there, and because it was placed near the window, it was also the best place to talk, to gossip while we smoke, most of the times clothes were put in there too. Although there was also a cupboard but it was always almost empty because we have the edge of the bed to put the clothes in. Also, there was a table that supposedly for work space but instead, unused bags, pennies, left-over foods, cigarettes, sometimes clothes or towels but mostly the towels found occupied the chair’s back or a body lotion. It was that we did not try to keep the room clean. The room was always clean, for the ground section. But there was too many unnecessary things kept in the room—the room wasn’t even just one people or two but three, and things were misplaced everywhere so they made the room looked like a wrecked ship. Most of the time, we spent our evening in that small room talking about anything or nothing. We just hit our twenties that time, so love would be the most inappropriate things to talk about. We shared, shared, shared, and shared. Strangely, we never ran out of topics. There had to be something to talk about. Especially love. There had to be something to talk about love. It was late April in 2017 when one of us had just encountered one terrible thing. The cold breeze swept the room’s atmosphere away. The room was occupied with the tree of us and I had never felt so stuffy being that room before but that evening was an exception. A voice broke the silence that suffocates the room. It was the sound of disappointment, a sigh that indicated that something has gone very wrong. What happen? I asked. But neither of us could answer. What? Why? I insist yet the silence still lingered, still no answer from them. I started to panic, though I wasn’t sure if it was my place to be panic at that time. I saw anger, despair, and hurt in her eyes. Her face reddened, her hands were trembling, and her lips were dry. I nudged her side playfully, attempted to joke it off. But still, nothing came out of her mouth. The situation was rather cold. Not only because of the weather but because of the oddness of thismoment. He’s trying to blackmail me. Finally, her voice creaked out. I understood the situation right away. It’s just that she never spoke to me about her love life. We talked about it almost every time possible. How this, How that, who’s this person and what had to do with her, who’s that person and what had to do with me, but this one’s different. It was almost two weeks ago before that day when the event encountered. It was in the middle of a sunny Thursday and she called me saying that she was in danger. I did not know what to do or what to responds to her. That’s right; I panicked, although I wasn’t sure if it was really my place to panic. Of course it was my place to panic. She is my friend. I cursed. That’s right, I cursed. That’s how I know that I panicked. And now, she explained further about that. Just before I could ask why and what happen this time, she explained. Her voice sounded hoarse but no tears came from her eyes. It’s okay. I tried to reassure her. She was angry and so did I. The event of that sunny Thursday became the most historical moments in our lives and since that day, for the first time after almost twenty years of living and nothing, I realized that these people have an important role of the turning point of my friendship life. I have never had friends like them before. It was never something personal—the friendship that I had before this. But these two individuals made it different. They told me their personal interest, their concern, worries, and fear, favourite dark lipstick colour brand, favourite food in town, someone they hate (probably by many people too) so I knew things. I didn’t ask about those things. It came out of nowhere in the middle of our meal time or smoke break. Never had I told anyone about what was deep beneath the surface everything that was not right about everything—family, annoying environment, and the guy I had crush on with. I always had something to share about those things to them and every little thing specifically matters though they didn’t always demand me to tell about it. Maybe because they did the same or maybe I trusted them enough to hear my story. Words just came out of my mouth naturally as if they were a cute new diary that I had just bought from the store and I couldn’t help it but to write my every day stories and I just didn’t want to miss every detail to I wrote about everything; not only the headline, the surface, the summary, but the details. We met only for a year and it’s crazy that we told each other everything and we didn’t feel bad or regret about it, about our meetings also. I believed that fate did not have to work that hard for him to be working on us. We just clicked like that, with no frills or anything like that. It came to a realization that things did not complete us. Each of us three were already complete as a whole. But the tree of us were longing for a home and companion. And it happened that we just came across each other, so rested our heads and hearts in not so spacious space and again, we just clicked. The room collected special memories of us. It is quite a shame that we didn’t own the room anymore. The washed-yellow painted wall heard more stories about us and kept them by itself. Every corner of the room has our footprints stamped on the floor. New scents probably came in as the new owner filled in the room. Maybe the new owner likes citrus or lemon, something the tree of us loathe. Maybe the new owner of the room likes to be alone. Maybe she put her clothes arranged neatly in the cupboard. Maybe the room has changed in every aspect. But what the three of us had in that space was, is, and will always stay there. In my vanity, there’s no friendship like us. 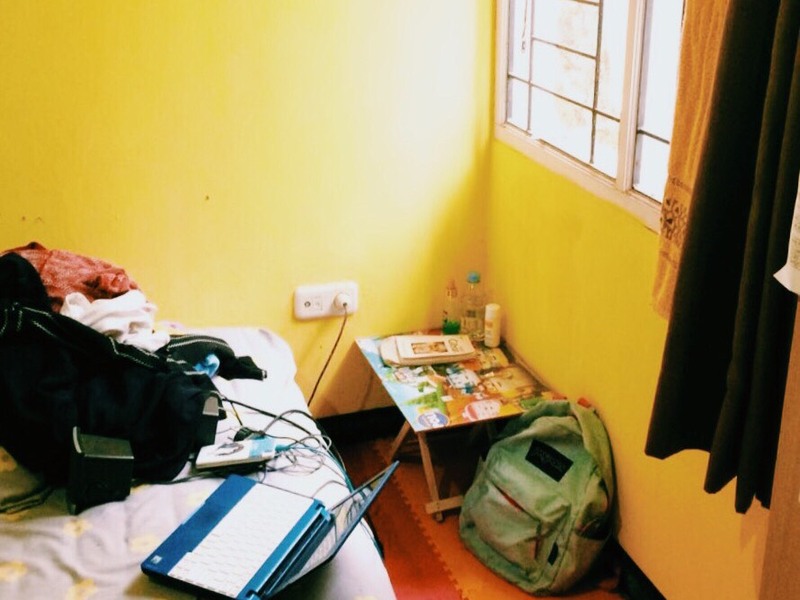 In that mini-home, we shared laughter, tears, hugs, bad words, and memories. In that small room, we intimate.